Rev. 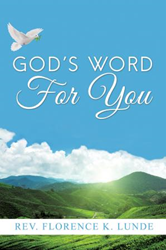 Florence K. Lunde’s new book, God's Word for You, ($13.99, paperback, 9781498471046; $6.99, e-book, 9781498471053) shares her personal story with an important message: Jesus loves His children just as they are, no matter what. At age twelve and a half, Florence came down with respiratory paralytic polio with bulbar polio and was paralyzed from the neck down. Physical and occupational therapy eventually allowed her walk on crutches and leg braces but outside the apartment, she required a wheelchair to be mobile. Her physical disability caused her to deal with feelings of frustration, anger, and depression a good portion of her young adult life. She even contemplated suicide during her college years because she couldn’t accept the intense emotional pain. During one emotional outburst, she said, “God help me” and Jesus the Messiah appeared. She kept this meeting a secret for many years to come. It was only later that she realized how much God played a role in her life. Despite her challenges, God always kept His hedge of protection around her. So many times she could have seriously damaged her life through her poor choices or enemy attacks, but God was there to protect her – even from herself. She proves through her story that He wants His followers to be saved, healed, delivered, and living their life for His glory. In the early 1980’s, Rev. Florence K. Lunde and her late husband, Manford, founded His Abundant Love Ministries (HALM) in New York City – a ministry by/with people with physical disabilities. One of the ministries of HALM was their television show, The King’s Table, shown on public access in the Bronx, NY. The show won three beta Awards. Rev. Florence received her M.A degree in speech-language pathology, completed the Berean College of the Assemblies of God, and received her graduate certificate in Christian ministry from the King’s seminary. In 2006, they retired and moved to Florida. Sadly, Manford passed away in 2013. Rev. Florence presently attends Love Never Fails Ministries, Florida. Xulon Press, a division of Salem Media Group, is the world’s largest Christian self-publisher, with more than 15,000 titles published to date. Retailers may order God's Word for You through Ingram Book Company and/or Spring Arbor Book Distributors. The book is available online through xulonpress.com/bookstore, amazon.com, and barnesandnoble.com.